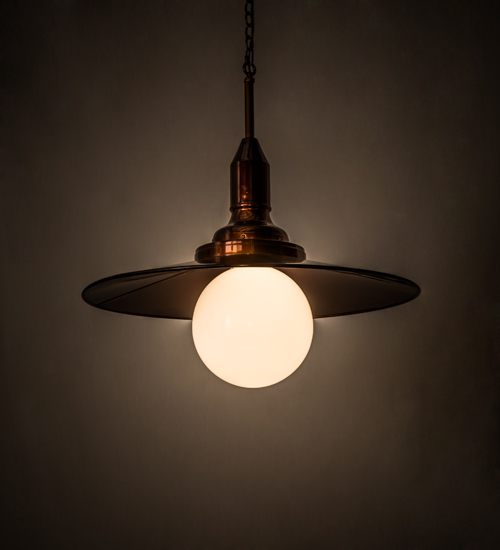 Description: Combining an industrial chic with the stylish design of an urban loft, Schotel adds a dash of charm to a minimalistic design with a White Glass Orb diffuser topped with a reflector projecting downward light. The Solid Copper reflector, frame and hardware are featured in a Transparent finish. Ideal for illumination as a centerpiece in lobbies, conference rooms and foyers, this luxurious pendant provides dependable functional illumination with an18-watt LED lamp which delivers energy savings, reduced maintenance and long life. Handcrafted in the USA. Custom styles, finishes and sizes are available, as well as dimmable lamping options. UL and cUL listed for damp and dry locations.